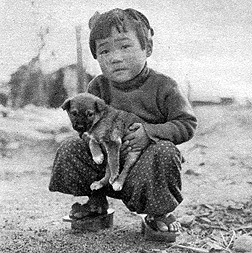 Michihiko Hachiya (1903-1980) was a Japanese medical practitioner who survived the Hiroshima bombing in 1945 and kept a diary of his experience. He was Director of the Hiroshima Communications Hospital and lived near the hospital, about a mile from the explosion's centre. His diary was published in 1955. He described the effects of the atomic bomb blast from its first flash in the early morning as he rested from his night shift as an air warden at the hospital. The force of the blast stripped all the clothes from his body but he and his wife survived.